We’re shopping for an outdoor table to add to our new larger roof garden this spring. We’re trying to find a table that can function as a bar, a potting table, and a buffet for serving and holding an electric grill. We want to spend $500 or less and, of course, it should look great too. Here are some top contenders. Do you have advice for RP and me ? What would you pick? We keep coming back to this Martha Stewart Plum Island our bar ($399) from Home Depot. We could store the grill on the bottom shelf. The half-circle shape with folding leaves will help us to conserve space, and it could be fun to pull out and play bartender for our guests sometime this summer. We’d be glad to get the two stools. Sitting on our roof garden at bar height would let us look over the parapet for a better view. This seems like the perfect spot for RP and I to share some wine up on the roof this summer. 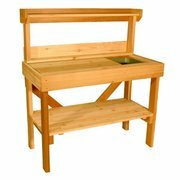 This cedar potting bench from Walmart is the best deal of the bunch at $299. We like how it has a dry sink: use it for soil, use it to ice some wine or beer. It doesn’t have the same swanky style as Martha’s bar, but this might be more sturdy. This option has four star reviews too. 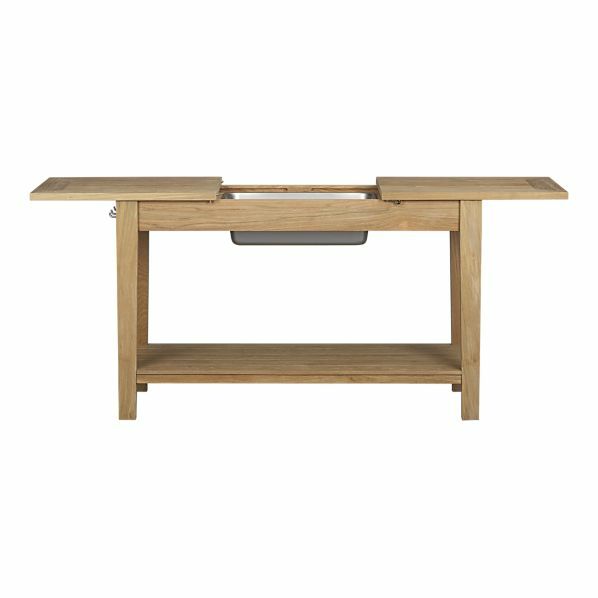 The Regatta Console ($949) is beautiful – a beautiful, teak budget buster. With mortise and tenon construction, this might be the sturdiest of the bunch. It also has the most polished look. At only 30″ high, it wouldn’t work well as a bar. We like that this console, like the less expensive Walmart option, has the dry sink. If we expand the budget, we could also look at options from Pottery Barn or this Carmel Bar Table ($560) from Restoration Hardware. Do you have any suggestions for an outdoor buffet + bar + potting bench? GRDN Brooklyn is offering a 10% off discount on some Fernmob furniture this weekend. RP and I are on the hunt for the perfect chaise lounges for our new roof garden. We’ve never shopped for serious outdoor furniture before and it really is overwhelming: Metal or wood? Solid or sling back? Arms or no arms? Heck, would you like stripes with that? Not too expensive, not too ticky-tacky, nothing too Golden Girls or Titanic looking. We need something that won’t blow off the roof, and Sunbrella fabric would be a plus. 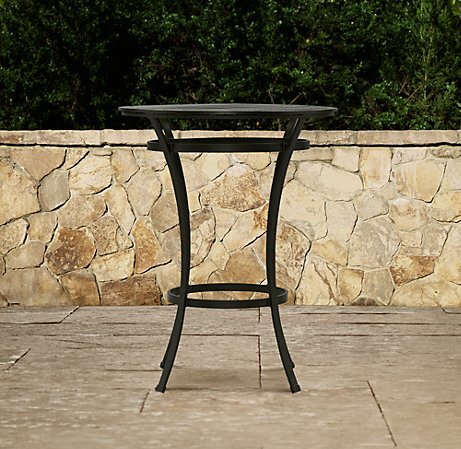 We’re shopping for two chaises that are stackable and fit in with our existing brown outdoor dining table and chairs. We’d like something that’s sturdy, not too hard to assemble, and can be delivered all the up to the 5th floor roof for a fair delivery charge. Since we live in NYC, we probably won’t even be able to see what we pick before it is delivered — most stores don’t stock much of their outdoor items here. We’re looked high (Restoration Hardware, Room & Board), low (Target.com – much larger online selection than we expected, Home Depot), and in between (Macy’s, Crate and Barrel, Amazon). Outdoor furniture shopping in January? A saleswoman laughed at RP when he called her this morning to ask about cushion colors and delivery time, but we’re discovering this is a good time to shop: many stores have sales right now, you can still snap up some discontinued items from last summer, and the new items are starting to debut. The best-priced, best-looking stuff sells out fast, we’ve learned. Can anyone help us with our patio peoples’ problem? This morning, these two are on the top of our list: The Madison patio chair from Macy’s, on sale for $399. The metal will coordinate with our other furniture and we think we like the arms. It could be too light for the wind that can gust across the roof, and we’re hoping we’re not limited to only green cushions. My spendy favorite is the Valencia Chase from Crate & Barrel, $899 (picture at the post of the post). The rest of our outdoor furniture is from Crate & Barrel and it has been even more durable than we expected. I also like the modern, luxe look of the Valencia and the plain stone color. But RP is worried about the gas pedal that sets how far back the chair can go. Could we break it after too many margaritas? Plus $899 feels so expensive, but we’re planning to spend every sunny minute we have up there from spring to fall.